Preheat the oven to 200°c or gas mark 6 and line a large baking tin with parchment paper. In a medium sized mixing bowl, stir together the strawberries, sugar, balsamic vinegar and basil and set aside. In a separate large mixing bowl whisk the flour, baking powder, baking soda, salt and sugar. 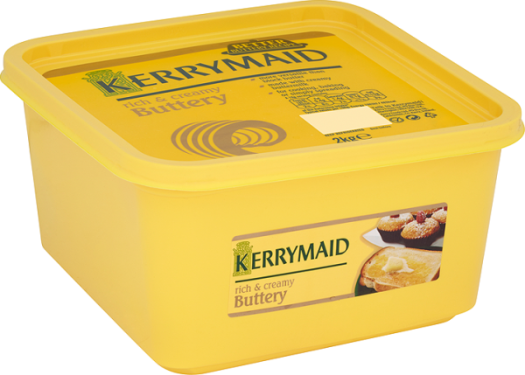 Add the Kerrymaid Buttery to the whisked mixture and mix lightly with a fork until it is just coated with flour. In another bowl mix the buttermilk, vanilla extract, ricotta cheese and beaten egg until well stirred. Combine the mixtures from Step 3 and 4 into a doughy texture, don’t overmix. Cover a surface with flour and gently knead the dough. Knead the dough into a disc-like shape and cut into 8 smaller circular discs using a biscuit cutter. Place the 8 circular discs onto the pre-prepared baking sheet and brush with Kerrymaid Double. Bake for approximately 12-15 minutes or until light brown, then cool the shortcakes on a cooling rack. While these are cooling, beat the Kerrymaid Double, sugar and vanilla extract until peaks start to form. It should take around 2 minutes. Slice the shortcakes down the middle and spoon the pre-prepared balsamic-basil strawberries over the bottom half, then place the lid of the shortcake back on top to cover. Top the shortcakes with the Whipped Kerrymaid Double and serve.